Update, June 19: Cyberpunk 2077 will let you steal a ride and drive in third-person with its many vehicle options. 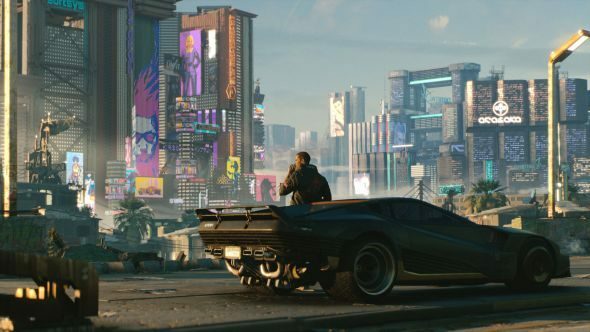 Cars featured pretty prominently in the Cyberpunk 2077 trailer, and we know from that (still secret and private) gameplay demo at E3 that you’ll be able to explore Night City in your ride of choice and get into vehicular action with car chases out in the world. That all might sound a bit Grand Theft Cyberpunk, and the comparisons don’t end there. You won’t be limited to the single car we’ve seen in the trailer, as it seems you can steal whatever vehicle catches your fancy, according to associate designer Kyle Rowley. Dig into all the biggest upcoming PC games. That quote comes via Reddit, where Rowley has also been answering other questions from fans eager for more details. Here he also confirmed that you’ll be able to optionally drive in third-person, the only time you can leave first-person outside of cutscenes. You’ll have plenty of options, as there are “hundreds of cars, bikes, and other types of vehicle” in Cyberpunk 2077, and it looks like players will have access to all of them. In a press demo at E3, a CDPR representative stated that “players are free to explore Night City with hundreds” of vehicles. What those other types of vehicle might be isn’t clear yet, but there have been reports (as well as sightings in the game’s trailer) of flying cars, which could appear in the game. We can but hope. CD Projekt Red has sadly been hesitant to show gameplay footage besides that trailer below, so what we’re hearing comes fromTwittervia those who’ve seen a lengthy private gameplay demo, as well as an interview with associate designer Kyle Rowley fromGameSpot. Today’s info drop also brought us details on everything fromstreet credto themap, but there’s still plenty more to find out. We still don’t know when the Cyberpunk 2077 release date is coming, though given the game’s ambition it might still be a while until we get to play it for ourselves. In the meantime, you can be sure we’ll bring you all the new details as we hear about them.